Patrick is at the age where he asks to do a project almost every day. He's curious and inquisitive and wants to know how everything works. Thankfully we haven't run out of ideas yet. And thankfully, he's 3 1/2 so going on a "bug hunt" (taking a walk with a magnifying glass and a bug catcher) still qualifies as a science project. He does, however, spot the difference if I respond to his mid-morning question about what our project of the day is. If I answer color or paint he'll give an exasperated sigh and say, "No MOOOM, a project that we DO, not just color!" (Like coloring is the most. boring. thing. ever.) Maddy would disagree. She will sit and color for 20-30 minutes at a time and be perfectly content. But she also enjoys our crafts/projects just as much as Patrick. She just goes with the flow, that one. Since our lives are filled with "projects" these days - some planned, some spontaneous - I thought I'd share a couple of our recent ones and do a project-a-day post for this week. The first one happened by chance. We had left over string from one of our Valentine's Day projects and pipe cleaners from something else and somehow the subject of spiders came up and so we made a huge spider web around the living room with little spiders that "climbed" on the web. 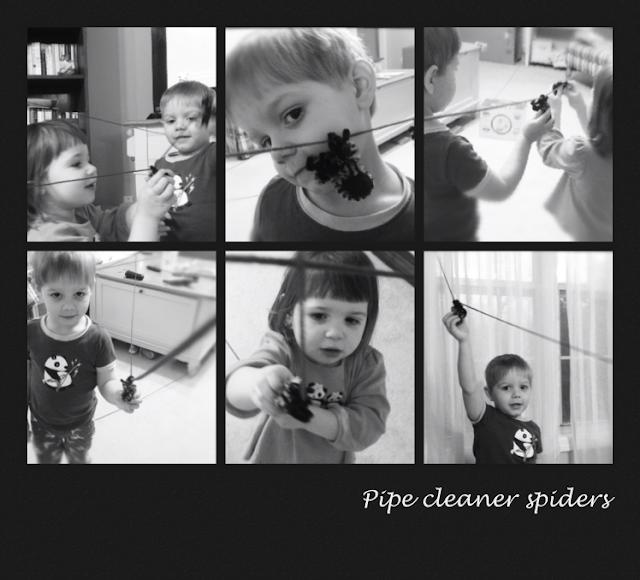 The kids had a blast helping wind the string around things in the room until it resembled a web then moved their spiders along it. 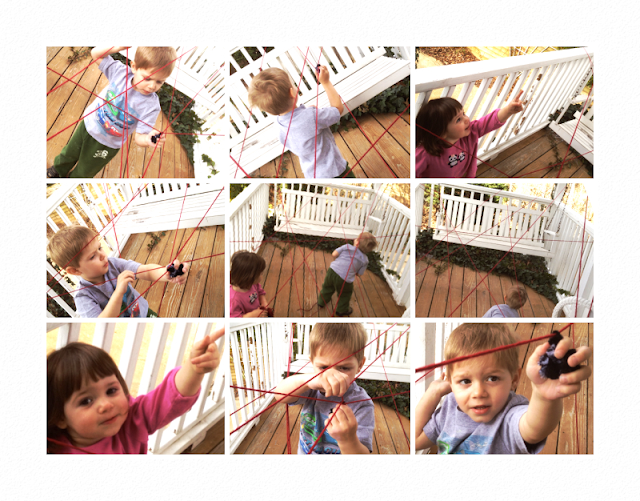 A few days later the weather was nice outside so we reconstructed our web on the front porch. Then we took our magnifying glass and walked around the yard looking for real spider webs. We talked about how many legs spiders have, what they eat, how they make their webs, etc. The kids seemed to enjoy it and maybe learned a little bit too. I, for one, learned that my children have absolutely no fear of sticking their hands into a huge spider web growing in our ivy to feel around for spiders. Yay! I can't wait to see more! This one is really neat. You always have such fun and creative projects!